It is now literally just a matter of months before Putin's Russia could shake the foundations of NATO and the security structure of Europe. Moreover, Putin may have the opportunity to do this with elegance, with simplicity and in perfect legality. The possible gains for Russia far outweigh any reason for restraint. All signs indicate that Kremlin strategists have long been aware of the opportunity, and have been actively working to seize it. The groundwork is ongoing and plain to see. In autumn of this year, politicians loyal to the Kremlin will be in a position, formally and legally, to take political control of the central Baltic State – Latvia. The next step would be technically simple – a newly elected government, beholden to Moscow, would withdraw Latvia from NATO. And this would change everything far more profoundly than we might imagine. At present, for various reasons, many strive to deny such a scenario. Russia and its friends in Latvia vehemently deny it because they understand that arousal of public opinion could affect parliamentary election results, and their plan might fail. For their part, politicians loyal to NATO lull the public with expressions of wishful thinking: "It won't be that bad". In some sense, it is possible they are right – the Kremlin's chances for success are not entirely self-evident. But does that mean that they will exercise restraint, given that the stakes are so high? It is not an exaggeration to say that success for them would cast in concrete the foundations of Putin's power and his historic reputation. Why is there a heightened possibility that this time around political power might be taken over by a Kremlin-friendly government? Latvia, of course, is a parliamentary republic. In October of this year, there will be parliamentary elections. Current polling indicate that the most popular and most stable political party, at 20%, is Harmony, which is traditionally oriented to Russia. In previous parliamentary elections this party has consistently received the most votes for a single party. In awareness of its pro-Kremlin orientation, all the other parties have, in the past, united in coalition to oppose it. However, at present Harmony is a monolith compared to the very fragmented and weakened pro-western parties. Many of them are at risk of not being represented in parliament at all. Taking into account the fact that the threshold for representation in Parliament is 5% of the vote, dividing up equally the number of undecided votes gives us an idea of what the next Parliament of Latvia might look like. Harmony, loyal to Russia, would get 35.7%, the dubious Greens and Farmers – 24.3%, the National Alliance – 11.1%, Unity – 8.5%, and the New Conservatives – 6.4%. If the Harmony and the Greens and Farmers form a ruling coalition, they would have 60% support. Of course, this prediction is based on polling in the month of March, and it could prove entirely wrong. Previous experience, in particular with local elections has shown that extrapolation from pre-election polling can be misleading. In the local elections, Unity and the New Conservatives received many more votes than predicted. Also, it must be taken into account that, in parliamentary elections the electorate makes its choices based on broader consideration than party loyalty. There is a traditional fear of the influence of the Kremlin, and therefore voters deliberately vote so as to prevent Harmony Center from taking over the government. This was observable in the last parliamentary election. But will it be the same this time? Pre-election prognostication and extrapolation from polls is a thankless undertaking – the supporters of those parties which are not favored will, of course, loudly protest. However, in Latvia at this time there are several undeniable facts. The pro-Kremlin Harmony Center party is monolithic, stable, experienced, and it can count on massive support from widely accessible Russian TV channels. The second largest party, the party of the current Prime Minister – the Greens and Farmers party – professes loyalty to NATO. But a large number of its leaders have career experience working with the Communist Party of the Soviet Union, with deep ties to their former comrades in Moscow. Many members of the Greens and Farmers party continue to have close business ties with Russia. Government ministers from the Greens and Farmers party often meet with Russian officials on the ministerial level, many of them under a dark shadow of corruption. Many Greens and Farmers heavies, the actual decision makers, command the Russian language as their main, and, in some cases, their only second language. There can be no doubt that Russian security services have at their disposal more than enough information on these politicians to read them like an open book. Finally, it should be remembered that the Greens and Farmers are the party which runs on the decisions made by just such men - the ones whose tails are pinned to offices in Moscow. These are the largest political parties for the coming election – one unerringly loyal to Russia, the second, not professing loyalty, but very closely bound to Moscow. But what about the so-called pro-western block? It is very weak. These parties are splintered to the point of impotence. Their leadership is ineffectual and unpopular. More or less respectable is the national conservative block – the National Alliance and the New Conservative party. But that alone will not be enough to stand effectively against a broadly branching network of agents of the Kremlin's political manipulators. In the West there is much talk about alleged Russian manipulation of the Brexit vote in Great Britain and interference in the presidential campaigns of the USA. Here it must be noted that Latvia is especially vulnerable in this regard. Kremlin folks are as much at home in Latvia as fish in water, not seriously surveilled or hindered. Even Lattelecom, the largest cable TV operator in Latvia is "unable" to put limits on the influence of the Kremlin on Russian-language TV channels. Russian TV channels are, in fact, included in every cable TV operator's unalterable "packet". Not one of the innumerable government institutions devoted to doing battle in hybrid war has been able effectively to limit Russian propaganda broadcasting. Indeed, it can be said with certainty that any attempt at putting limits on hostile propaganda have been regularly sabotaged. It might have been possible not to "notice" this for a year or two, but for four? Not possible. But that is exactly the amount of time that has passed since the onset of Russia's aggression against Ukraine. Such obvious inability to put limits on Russian disinformation and propaganda in Latvia, and the unchecked ability of high officials with Russian connections to access Latvia's national security secrets, makes it plain that the influence of Russia's Security Service on Latvia is enormous. In sum, this influence could lead to a critical situation in the central NATO member state in the Baltic region, Latvia. The Kremlin has access to vast resources for supporting political powers of its own choosing, and to execute precise, heavy blows against undesirable defenders of democracy. Russia is able to fund the most accomplished political strategists to support its loyal politicians in its "near abroad". Already at least since fall of 2017 it is evident that manipulation of public opinion is taking place. The Harmony Center party suddenly pretends to be a pro-western party, even renouncing its alliance with Putin's party in Russia, and its leader Nils Ušakovs undertakes a flirtation with NATO officialdom. Meanwhile, another pro-Kremlin party is activated – the Union of Russians in Latvia – which goes so far as to summon its "heavy artillery", Tatyana Ždanoka, who is deeply beholden to the Putin regime, to return Latvia from her seat in the European Parliament. These are only the most brazen examples that testify to the Kremlin's coordinated and farsighted pre-election planning for Latvia. The probable goal is to form a coalition: Harmony Center with Greens and Farmers. In this coalition the larger party and therefore the leader would be friends of the Kremlin. They would have every right to demand the offices of prime minister, finance minister, minister of defense and/or minister of the interior. In view of the fact that Latvia has non-transparent parliamentary oversight of its security services, and social media are just as vulnerable, it is clear that a further consolidation the political power of Harmony Center and other friends of the Kremlin will be a relatively simple process. In such matters, one cannot fault the Kremlin's specialists for lack of experience. Manipulating with the power of bestowing or denying access to state security matters, the government could, in fact, decree any politician or high official to be untrustworthy. Courage and decisiveness on the part of the present leader of the Constitutional Defense Bureau is a PR myth, with no connection to reality. Kremlin officials could control the government and the security services by placing its loyal servants in key offices. Pressure on public opinion could be exerted very simply through public TV and radio. Kremlin officials would not need to worry that agencies of the European Union might hinder them in this take-over. The EU has proven itself to be ready to look away to avoid seeing human rights violations and brutal repression of democratic norms in other parts of Europe. Just why are the stakes so high for Putin? 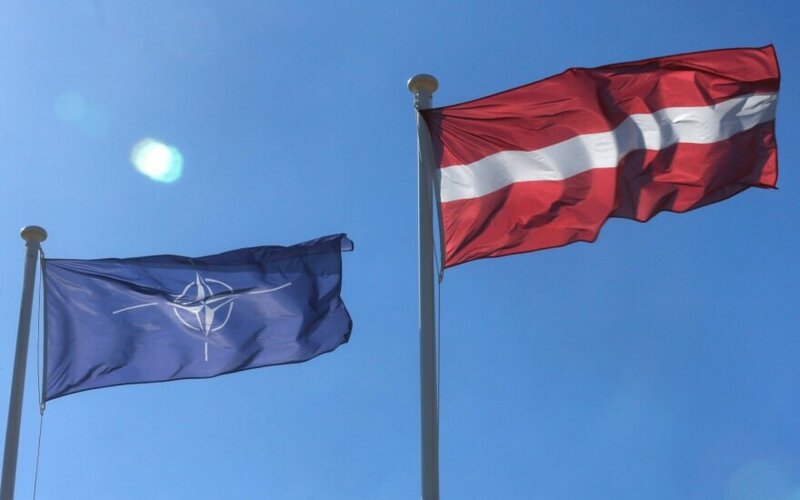 The prize is that a compliant and friendly government in Latvia could achieve the withdrawal of Latvia from the NATO block. The citizens of Russia have been conditioned to regard NATO as its greatest enemy in the world, and such a blow to NATO would automatically cement Putin's reputation in Russian historical conscience. Of course, here it must be understood that Russians see Latvia in a very different light than do the societies of the Western world. Politicians, diplomats and analysts of the Western world most often do not understand the importance of Latvia. To them, most often, it is simply a small Baltic state. Russia, on the other hand, does understand. To them, at least since the time of Czar Peter the First, Latvia has been its key to access to the Baltic Sea. To Russians, regaining Latvia would be a highly symbolic event, a correction, in their view, of an injustice wrought by the Cold War. Russians believe that the Western nations promised that NATO would not be expanded to include the Baltic States, and that this promise has been broken. To them, it means nothing that it was the wish of the Baltic States themselves to be included in NATO. By achieving the departure of NATO from Latvia, Putin would at least partially correct the "injustice" committed against Russia, and reduced the threat of NATO against Russia. But the Kremlin's political control over Latvia would be more than just a guarantor of the stability of Putin's domestic power. It would be a substantial threat to the security and stability of all of Europe – at least northern Europe, certainly. By achieving the withdrawal of NATO, Putin would in fact open wide the door to Latvia, which he could then take over in 12 hours' time with the military forces available to him, separating thereby the other two Baltic States. Estonia would, in effect, be surrounded, Finland partially so. Of course, this is not to say that Putin necessarily wants do any such thing, but the important thing is that he could do it, and this vastly amplifies the potential military threat to Sweden. Again, it is unimportant to guess whether Putin will or will not do this, but the diplomatic services of the Kremlin will have an upper hand, and the regional balance of power will be radically changed. And, of course, the prestige of NATO and the EU would suffer, and so would the prestige of the United States. Furthermore, historic precedent shows that Finland and Sweden would be forced to deal primarily with Russia's interests rather than with the interests of the EU or other international organizations. Having achieved political control over Latvia, Putin's Russia would enjoy a whole bouquet of possibilities. It is not possible to enumerate them in brief. A parliamentary coalition beholden to Russia could fundamentally change the citizenship laws, granting citizenship to Latvia's noncitizen population, which at present numbers 250,000. This would mean that in all future elections they would be guaranteed an irreducible level of support. Also, in view of the fact that the Latvian nation is on the brink of an accelerating demographic downslide and a collapsing work force, a parliament obedient to the Kremlin could open doors to immigrants from nations populated by Russian-speakers. This, of course, would threaten the linguistic viability of the Latvian nation. In much the same way, Russia could renew its economic influence over Latvia, making its economy once again vitally dependent on Russia. By subjugating Latvia under its control, the Kremlin would, in fact, gain partnership with various structures of the EU. These and other achievements are especially significant to Putin personally. As distinct from the annexation of Crimea, this time he would not necessarily need any crude military force. Victory would be outwardly correct, elegant and effective. The EU, NATO and US would get a slap in the face with a fine white glove. Of course, the average American probably would not even notice, but in Russia everybody would. And Russians would appreciate it. In order to achieve all this, all that the Putin regime has to do is cleverly exert its influence on the parliamentary process in Latvia. Then exert pressure on well-known and friendly people in the Greens and Farmers party. After that, make its loyally pro-Kremlin Harmony Center the ruling party. This would not be difficult for the political technocrats of the Kremlin to achieve in a society which they understand perfectly well, while the government and its security services are protected by professionally incompetent bureaucrats. There is no reason for Putin not to go for it. It was in Latvia that a "window on Europe" was once hewn by Russia's first emperor Peter I. Why shouldn't czar Putin try to hew NATO and the US out of his way this time?